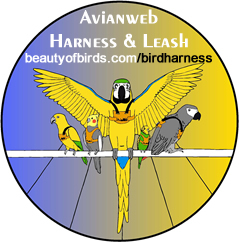 Avianweb Bird Harness: The EZ Bird Harness - Taking the Bird Harness into the 21st Century! 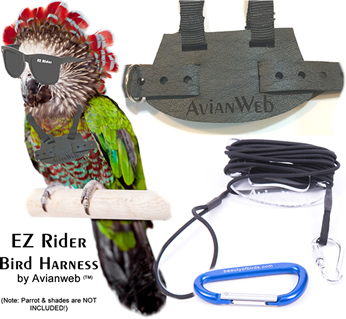 Avianweb's EZ Bird Harness is dramatically different from any other bird harness on the market. 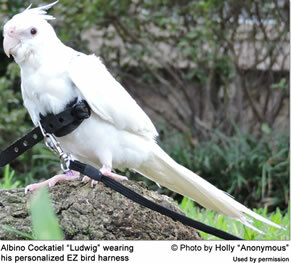 It is also the only Bird Harness on the Market that can be personalized with a pet's name. The harnesses are made in the United States. We ship them internationally; however, please note that other countries may impose Customs Duty (Tax) on these harnesses (or any other merchandise). These additional fees are not included in your purchase, and we urge customers to research any fees that may be collected by their countries' tax authorities. Customer Holly e-mailed us a couple of photos of her pet "Ludwig" wearing the harness (published - with her permission - on this web page). She reports: "We ordered the avian harness for our cockatiel Ludwig. It is our second try at a harness and we really think it’s wonderful. Ludwig goes out 2 or 3 times a day in his harness and he doesn’t fuss at all when we put it on. What makes this harness better than his previous one is the leather and thin cord. On his old harness, he kept getting his talons stuck in the nylon and we always had to unhook his feet. I think it frustrated all of us. Also, this harness is much easier to put on with the belt looping below the wings instead of having to manipulate the wings through the harness ... We are very pleased with this purchase and think you designed a great harness." We focused on making training and installation of the harness easier than ever before. Our harness solved challenges of other harnesses: no more pulling wings through loops (which birds hate), easy and intuitive installation of the harness (without a steep learning curve). Note: birds still need to be slowly introduced and HARNESS TRAINED! Please follow instructions. We sourced the highest quality material and parts that we could find - bird safe and secure! 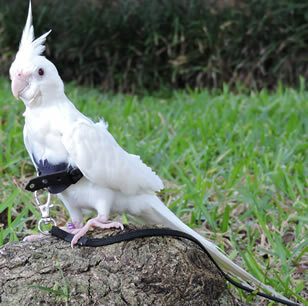 Vest / Small Bird Harnesses: Small harnesses (up to the size of cockatiels) are all made from faux leather. Vest / Larger Bird Harnesses: Neckline is made out the strongest nylon webbing - with a breaking strength of up to 2000 pounds. Ultrasonic Welding: The webbing and some of the components are bonded together using a high-tech ultrasonic welding technique - which eliminates the need for sewing (and the danger of threads) and some hardware. Included is a carabiner which connects the leash to a belt thus eliminating the risk of the leash accidentally being dropped and a bird escaping. The carabiners that we include comes in assorted colors (red, blue, green or silver). Unless we are contacted PRIOR to shipping to alert us to a color preference, we will ship out any of the colors. For the safety of your pet,please DO NOT FORCE the harness on a pet bird, which is likely to result in a STRESSED AND PANICKED BIRD that will fight to get out of the harness and that could result in injury. A pet bird needs to be properly introduced to the harness and TRAINED to VOLUNTARILY put its head through the head loop, and willingly allow its owner to close the abdomen belt up! 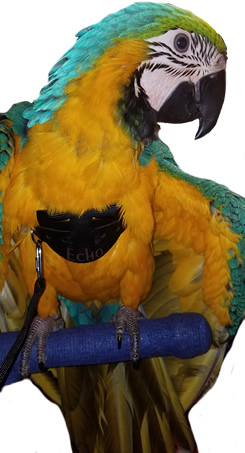 Once a pet bird is trained on the harness, it will look forward to wearing the harness as it will associate it with GOING OUTSIDE and having fun. PLEASE FOLLOW INSTRUCTIONS! That is the secret of success! Before EACH Outing please *check the harness and leash*. Any materials that we use on our Avianweb Harnesses are strong and of the best quality we could source, but parrots have POWERFUL beaks that can chew through hard nut shells and even wood. So if given enough time, they will chew through any fabric and webbing on the market. *Your satisfaction is IMPORTANT TO US! * If the harness you get doesn't fit, we will CUSTOM-SIZE for your pet at no cost to you. If you have any problems with your order, please allow us to resolve them! 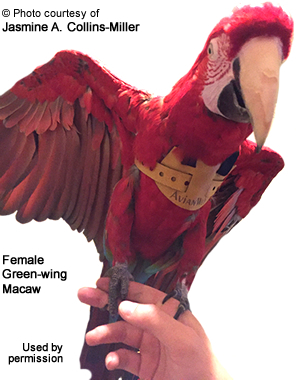 Our harnesses are made here in Florida by bird lovers who are as committed to the health and happiness of our beautiful captive birds as you so obviously are. BEFORE BUYING please consider - Is your pet HARNESS-TRAINABLE? You already trained your pet some tricks. If you put in the time to teach your pets tricks or modify undesirable behavior, harness-training should be a breeze ... You know what to do and you understand that you need to take it slowly. If your pet bites and/or doesn't like to be handled, your pet would not be harness-trainable at this point. However, most birds can be tamed and trained. It just takes time and patience. It may be best for you to wait until your pet doesn't mind being handled. Are YOU (the owner) patient enough to properly introduce the harness to your pet and undergo harness training? Most harness training fails because owners force the harness on their pets, which then results in a stressed, possibly injured bird. NOTE: **Because of our strong commitment to continuous product improvement, we reserve the right to make changes either in materials and models without notice. To buy - click here!